Fresh Gallup World Poll data shows that 83 percent of adults in developing economies have a mobile phone as of 2018. That’s astonishingly good news for development because mobile phones help connect people to the jobs, business opportunities, and services they need to escape poverty. Yet digital divides persist. Overall in developing economies, 86 percent of men and 79 percent of women have a mobile phone, leaving a gender gap of 7 percentage points. Gender differences vary widely across major emerging economies (Figure 1). 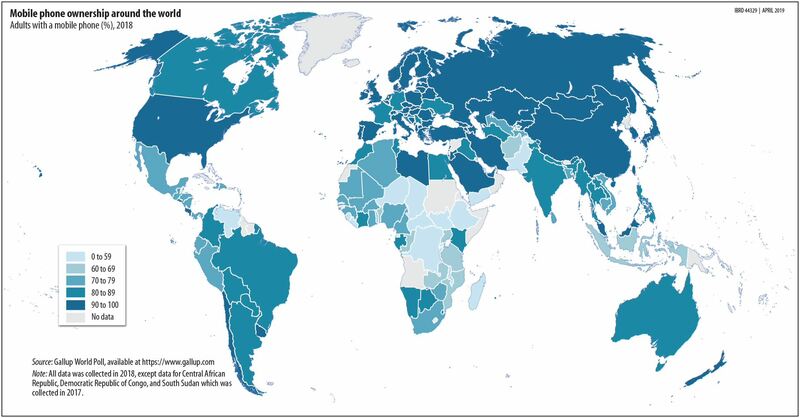 In China and Russia, mobile phone ownership is practically universal for men and women alike, while gender differences are also small or nonexistent in Indonesia, Mexico, and the Philippines. Massive gender gaps exist in economies such as Pakistan, where men are nearly three times as likely as women to have a mobile phone, as well as Bangladesh, Egypt, Ethiopia, and India, where gaps are about 15 percentage points or larger. Phone ownership, and a personal SIM card, is necessary to open a mobile money account, and in sub-Saharan Africa, mobile phones have brought millions of people into the formal financial system for the first time. While most people around the world do their banking with a bank or credit union, Africans increasingly use mobile money accounts accessed through mobile phones. The World Bank’s Global Findex database shows that the share of adults in sub-Saharan Africa with a mobile money account nearly doubled from 2014 to 2017. Mobile money users are often people who tend to be overlooked by the traditional banking industry—such as women, the poor, and those who live in rural areas where it makes little sense to open traditional bank branches. Mobile money can make personal banking cheaper and easier—and the benefits go beyond convenience. Research in Kenya finds that mobile money is much safer for entrepreneurs than cash. In addition to reducing theft risks, mobile transactions create a digital transaction history that can be used to qualify for credit. The results: higher business growth, productivity, and income. In countries with weak social welfare programs, mobile money transaction networks can serve as an informal safety net. One estimate found that medical bills pushed 100 million people into poverty in the year 2010. Mobile money lets people quickly and easily collect money from faraway friends and relatives during an emergency, which helps them manage unexpected expenses and stops them from sliding into poverty. Unlike cash—which is easy to spend, give away, and steal—mobile money can offer women financial control. Studies have argued that mobile money may help women escape poverty, get better jobs, and strengthen their role in household bargaining. In Afghanistan, employees who received digital salary payments and made automated deposits into a mobile savings account increased their savings balances and financial security. It’s also true that mobile money raises consumer protection issues. Mobile credit has spelled widespread debt and defaults, partly due to weak transparency. Any development strategy involving mobile money needs to address these concerns. Facilitating access to financial services is only one way mobile phones enable development. Studies have found that farmers can use mobile phones to research crop prices and marketing opportunities, which might help them negotiate fair compensation for their goods. The arrival of mobile coverage has been linked to higher consumption and reduced poverty in rural Peru. One reason women lag men might be that women are less likely to have official government-issued identification. On average, in sub-Saharan Africa, men are 9 percentage points more likely than women to have identification, and the gaps are twice as large in some economies, such as Ethiopia and Niger. Identification can be used for a variety of purposes—including to get financial services or qualify for government programs. 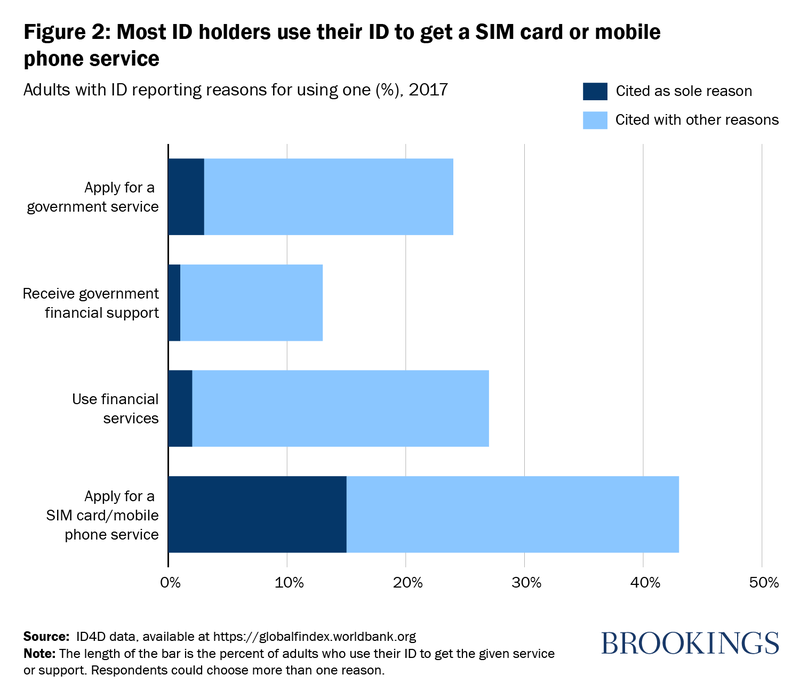 But recent World Bank survey evidence suggests that getting a mobile phone service is by far the most popular use of identification (Figure 2). 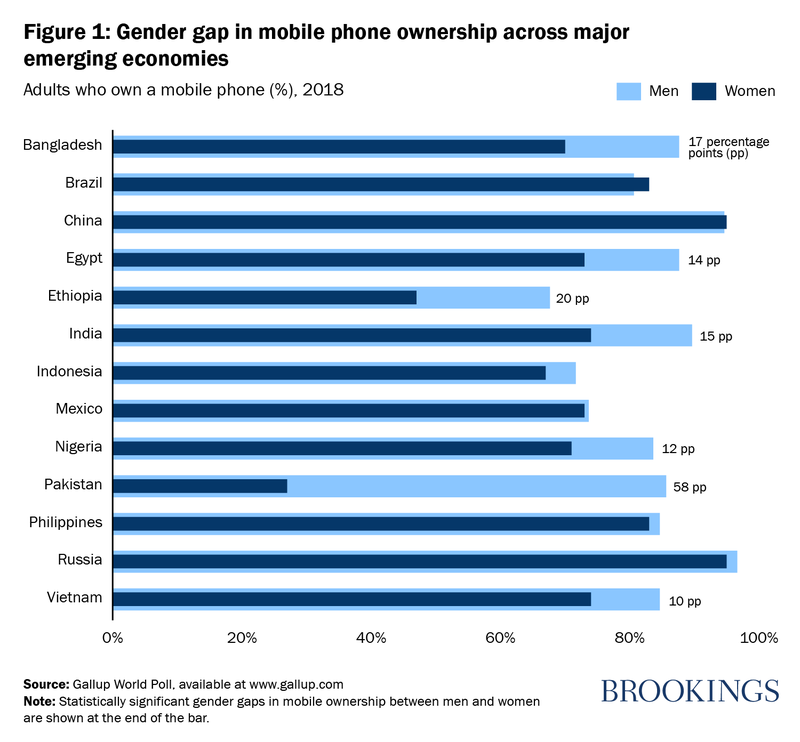 Since acquiring a SIM card/mobile phone service requires identification, the gender gap in identification may contribute to the gender gap in mobile phone ownership. Several additional factors explain why women’s mobile phone ownership is lower than that of men. Women are less likely to have the money and education needed to get a mobile phone. A new study in Bangladesh is examining the effects of access to female agents on female customers’ use of mobile money. And ongoing research in India suggests that gender attitudes play a huge role. For example, interviews reveal a widespread belief that mobile phones would make women less likely to remain chaste before marriage—and less focused on their husband and children after marriage. Backed by a growing body of research, policymakers are looking for ways to incorporate mobile phones into their strategies for financial inclusion—and economic development more generally. Their efforts will remain incomplete as long as women lack equal access to this basic yet critical technology.